While the task of prepping your walls for painting is tedious, it’s crucial to getting a beautiful finish. Don’t skip these steps. Follow these steps to paint a beautiful ceiling in any room of your house. These 5 common paint problems can be fixed with a little knowledge and time. Planning on painting your interior doors? Follow these seven steps for a professional, beautiful finish. Have a small space that feels too cramped? Use these paint tricks to open it up. Maintaining your home's paint is crucial for its appearance -- and for the integrity of the home. Learn the 6 signs that indicate it's time for a repaint. Which Paint Color Is Best for Your Master Bedroom? Choosing master bedroom paint colors is fun and exciting! It can also be overwhelming and frustrating. Take a look at what mood different colors set in the master bedroom to help you start narrowing down your choices. What paint colors will increase your home's value? Keep reading to find out. Everybody's Doing It - Should You Pressure Wash Your House? Your neighbors have pressure washed their house to keep it clean. Is this something you should do too? Maybe, but only if it's done right. Read on to learn how. The kitchen is a greasy, messy place. It really takes a beating several times a week (or day). 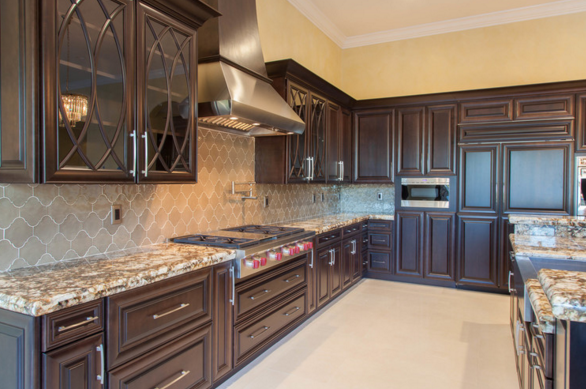 From grease splatters to liquid spills and dishwasher steam, your cabinets are exposed to varying temperatures and messy substances. Keeping the cabinets clean, especially if they are painted, requires you to take proactive steps before the grease and grime build up. Your cabinet faces should be cleaned about every other week. But how can you clean the cabinets without damaging the paint? No matter the finish of your cabinet paint -- lacquer, semi-gloss, or anything else -- stay away from abrasive cleaners or cleaning tools. Using harsh cleaners or rough tools can dull or damage the paint. Avoid strongly alkaline or acidic detergents. It's best to start with the gentlest cleaning method and work your way up. Sometimes, the simplest, gentlest method will do the trick (especially if you stay on top of cleaning your cabinets), while other times will require slightly stronger methods. The gentlest, easiest method is to simply wipe your cabinets down with a damp, soft cloth. If this rids your cabinets of splatter and dust, congratulations! You're done! Go take a relaxing bubble bath with your extra time. If you still are faced with grime and grease, mix a bit of detergent with warm water. The measurements aren't exact -- just add enough detergent to a bucket of running water to make suds. Dip a microfiber cloth into the suds and wring it out. Rub the damp cloth on your painted cabinets in a circular motion, repeating until the grime is gone. Take a second microfiber cloth, and get it damp with non-soapy water. Go over the cabinet with the damp cloth in a circular motion, being sure to remove all soapy residue. With a third (dry) microfiber cloth, dry the painted cabinet, using a circular motion again. Done! Go have a relaxing bubble bath to unwind from all the effort. If you still have yellow grease spots left over after your thorough (and gentle) work, try this method to spot clean those areas. Combine these all together, dip a soft cloth into the mixture, and spot clean those stubborn areas. Wipe the areas dry with a dry cloth when done. You can also try combining equal amounts vinegar and warm water in a spray bottle. Spray onto the grease spots, let sit for five minutes, and wipe away. If you're not already in the habit, the New Year is a great time to be more mindful of messes in the kitchen. Commit to wiping up grease spills as soon as they happen so you can avoid dealing with grease stains later on down the road. Add a basic cabinet wipedown into your regular housecleaning routine to stay on top of dust. This will help you keep your painted cabinets looking clean, beautiful, and updated far longer (while cutting down on extra work). New Life Painting can help you get the kitchen of your dreams, whether that's simply painting your existing cabinets, painting your walls, or remodeling the whole room. Give us a call at (805) 937-9836, or contact us online for a free estimate. How tall should your baseboards be? What material should you use? What style does your home call for? Find out the ins an outs of baseboards. Have a small kitchen? Learn how you should paint the walls, cabinets, and trim to visually expand the space. Does the color of your workplace matter? Read how to get better productivity -- and more -- with the right colors in the office. 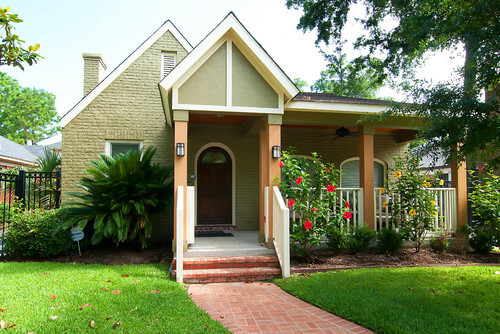 Should you paint the exterior brick on your home? While it may be tempting to update your home's look in this way, you'll probably end up regretting your decision. Read on to find out why. The answer depends on where you live, what kinds of materials are on your house, and the quality of the last paint job. Read on to find out full details. Clean walls make your home feel and look good. Learn what to use to clean painted walls. Painting a room, piece of furniture, or door is a great way to spruce up your home. And because almost everyone can use a paint brush, painting is also a popular DIY home project. But just because you have the ability to brush some paint on a wall, that doesn't mean you know what you're doing. Know these quick tips before your next project. It's best to paint when the air is as dry as possible, so skip painting on humid or rainy days. Wait for relative humidity to be between 40% and 70%. Don't paint exteriors when it's raining. Open a window when you're painting inside, and allow the paint to dry completely before adding another coat. You can derail your budget if you don't plan accurately for your project. Running out of paint mid-project just adds time and expense. Plan on one gallon per 400 square feet, but if you're painting a rough texture, you may need more. If you paint over an area that has already begun to dry (which can happen in a minute or less in dry conditions), you'll end up with lap marks lining your walls. To avoid this, keep a "wet edge," meaning each new stroke should overlap the previous one. With a roller, paint up and down the full height of the wall. Give the room at least 24 hours of drying time before you bring furniture and other items back. If your surfaces are not carefully prepped before you put roller to wall, it won't matter how carefully you paint, and it won't matter if you spend extra money on high-quality paint. Your hard work and money won't stick, and you'll soon see cracking and peeling if your surfaces aren't adequately prepared. To avoid this, sand and scrape any areas that are peeling, cracking, or flaking. Wash greasy spots with soap, and wipe your walls with a dust-free cloth. New Life Painting takes the time to thoroughly prep each surface so that your paint can last for years to come. You're done with your painting job, and you can't wait to get the room back in order. So you yank the tape off the trim -- only to ruin all your hard work. If you remove tape too early, or without the proper tool, it will pull dried paint off with it. Instead, wait for at least 24 hours before thinking about removing the tape. Then use a sharp utility knife to slice through the film. Pull up the tape at a 45-degree angle as you cut the paint. If you're not one for careful, thorough work, painting may not be the job for you. You can't rush a paint job without negative consequences. Take your time in prep work, and take your time in application for a beautiful finish you'll love for many years. Not everyone is cut out for the meticulous, careful work of painting, and that's okay. If you're not sure you're the right one for the job, call New Life Painting at 805-937-9836, or contact us online, for beautiful results. Why Does Paint Bubble, Peel, and Crack? Bubbling, peeling, and cracking paint is a nightmare. Learn why it happens, and what you can do about it. Do you need to shell out the big bucks for high-quality paint? Or can you get by with the cheap stuff? Read on to find out.